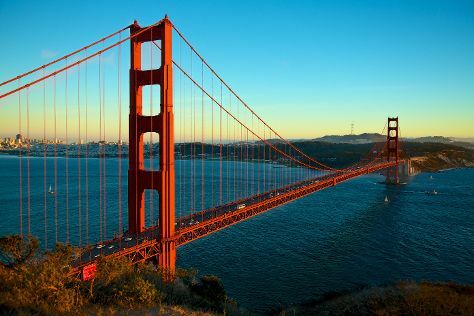 San Francisco is a top holiday destination featuring scenic beauty and great ethnic and cultural diversity. Spanish colonists established the city in 1776, but 80 percent of it was destroyed in the 1906 earthquake and the fires that followed. Despite its outsize reputation, the city is physically quite compact, located on a relatively small square of land at the tip of a peninsula between the San Francisco Bay and the Pacific coast. This allows you to take sightseeing tours of most of the city's neighborhoods, each with its own distinct character and microclimate, on foot or by bicycle. To get around town on public transportation, buy a visitor's pass, available for one, three, or seven days, for unlimited rides on Muni buses, trains, streetcars, and cable cars. San Francisco also contains more restaurants than any other city in the country per capita, providing dining options to suit every traveler's tastes. San Francisco is in California (CA). Add San Francisco and other destinations in United States to your travel plans using our United States trip itinerary site .